There are only a few days remaining to comment on a draft plan regarding the Lincolnshire Wolds Area of Outstanding Natural Beauty (AONB). A draft plan has been put together following a public survey to find out what issues are facing the Lincolnshire Wolds AONB, and you have until Wednesday, January 31, to have your say. The Lincolnshire Wolds Countryside Service and the Lincolnshire Wolds Joint Advisory Committee (JAC - AONB Partnership) are asking for the public to once again share their comments and input to shape the final Strategy and Action Plan for the nationally protected Lincolnshire Wolds AONB between 2018-23. Stuart Parker, chairman of the Lincolnshire Wolds Joint Advisory Committee said: “This is a plan for everyone and the evidence, aspirations, policies and targets set out in the documents will provide a very important tool for informing and guiding the future management of the Lincolnshire Wolds Area of Outstanding Natural Beauty. 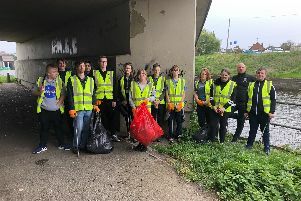 “We want the public to be a part of how the area is looked after and have their say on what it is that makes it so important to them. The consultation closes at 6pm on Wednesday. Alternatively contact the Lincolnshire Wolds Countryside Service. Every Parish Council in the AONB and the local Wolds market town libraries have been sent a paper copy.